Maximum carton width: 13-1/2” (listed width is nominal). Actual width 3/4'' wider. Deck requires no hangers, shelves, or retainers - a single piece of equipment to install. Unique end cut fits most standard beams. Maximum carton width: 18” (listed width is nominal). Actual width 3/4'' wider. Deck requires no hangers, shelves, or retainers - a single piece of equipment to install. 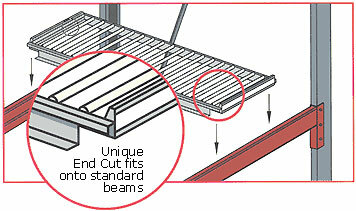 Unique end cut fits most standard beams. Maximum carton width: 22-1/2” (listed width is nominal). Actual width 3/4'' wider. Deck requires no hangers, shelves, or retainers - a single piece of equipment to install. Unique end cut fits most standard beams. 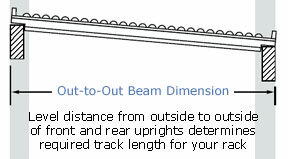 The critical dimension for ordering Deck Span Track is the Out-to-Out Beam Dimension. This is the level distance from the outside to outside of the front and rear uprights. Your track length must equal this measurement. Galvanized steel side channels, 3/4" diameter aluminum rollers require no maintenance or replacement.